Australia has taken action and has told the UN International Court of Justice (ICJ) that the country is totally opposed to any form of commercial whaling “whether it be carried out under the guise of science or not”. “Japan seeks to cloak its ongoing commercial whaling in the lab coat of science,” Bill Campbell QC said at the opening of a three-week hearing in The Hague. To present more clearly the consequences of the current whale killing practices, he said if all countries party to the 1946 convention killed as many whales as Japan wanted to each year, more than 83,000 minke whales would be harpooned annually in the Southern Ocean. It would be “catastrophic” for the whale population and would clearly be at odds with the purpose of the convention. 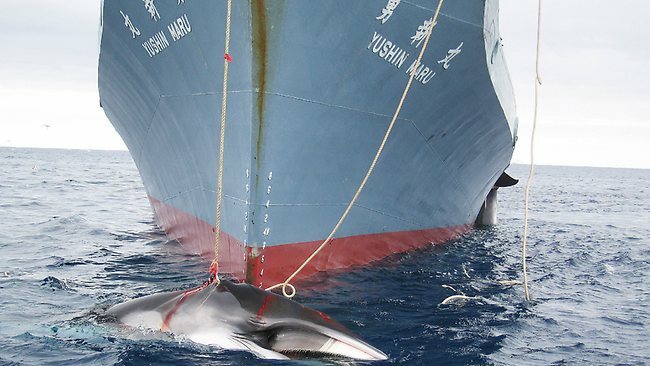 Canberra is hoping the court will issue a ruling banning Japanese whaling by the end of the year – soon enough to halt the next whaling season. A resolution by the ICJ would enhance the otherwise excellent relationship between the two countries, Mr Campbell said. In a rare move the court will hear from experts – not just government representatives and lawyers – during the three-week hearing. Australia’s experts will address the panel on Thursday while Japan’s are likely to appear next week after its opening submissions on Tuesday. This will certainly be beneficial for our certified operators offering whale watching experiences and who work to raise awareness about the protection of the species present in Australia. 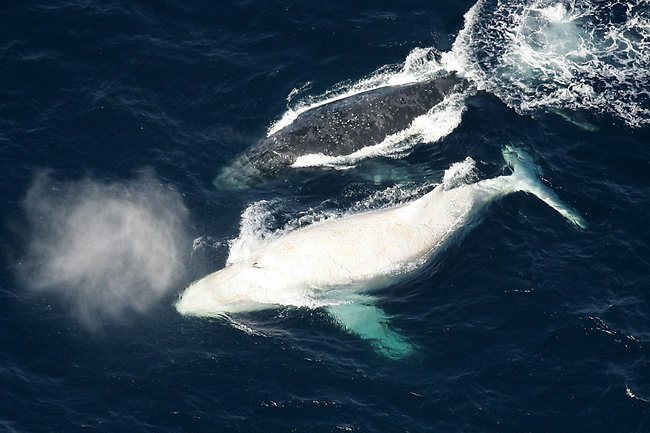 The news were welcome by the whale protection community and certainly by our celebrity white humpack whale Migaloo, which has by the way recently been spotted moving north! Great Ocean Road Surf Tours have now achieved Advanced Ecotourism certification. Previously Nature Tourism certified, the surf school has demonstrated a strong commitment to improve their environmental practices to reach the highest level of Ecotourism Australia certificaiton program. Located near Great Ocean Road Surf Tours are committed to protect the environment, reducing their carbon footprint and offsetting emissions through the Plant-a-Tree program and are involved in volunteering programs. Their website also features an online Carbon Calculator to work out your holiday emissions.some of Australia’s most popular surfing beaches, the multi-award winning school offers surf lessons for adults and children and takes the course to another level allowing students to make the lessons an unforgettable experience. For more information about Great Ocean Road Surf Tours or to plan your next surf lesson visit their website. For more information about Nature Tourism and Advanced Ecotourism certification visit our website. Well done to Jenolan Caves who have recently achieved Advanced Ecotourism certification. The Jenolan caves are amongst the finest and oldest in the world. From the earliest days of cave tourism, Jenolan has been a leader in developing environmental best practice and was one of Australia’s earliest ecotourism facility. In 1872, Jenolan Caves were the first caves in the world to be granted legal protection thanks to John Lucas, Minister for Mines, and a regular Jenolan visitor, who realised the damage that people were doing to the cave environment. The site has since been protected and preserved so visitors can still enjoy the beauty of the caves. For more information about Jenolan Caves or to organise your next trip, visit their website. For more information about Advanced Ecotourism certification, please visit our website. Are YOU eligible for a Tourism Industry Regional Development Fund Grant? An amazing opportunity presents itself for regionally based tourism businesses as the Department of Resources, Energy and Tourism announce Round 2 of the competitive Tourism Industry Regional Development Fund (TIRF) Grants Program. The TIRF are offering grants of $50,000 to $250,000 to businesses who have an innovative development plan in the pipeline that will increase the quality and range of visitor experiences available in regional Australia. $9.6 million of funding is available across three streams of eligibility to offer grants for 50 projects during this round. Eligible applicants must be situated outside the Sydney, Brisbane and Melbourne tourism regions, must be able to match funding costs, and must be planning development across one of the following streams; quality improvement of existing tourism products or service, innovative new tourism experiences, or tourism labour supply and quality through Labour & Skills Enhance. The TIRF Grant program encourages a wide variety of projects that support investment in tourism industry related accommodation, infrastructure, experiences and facilities. The type and style of eligible projects is unlimited and encourages innovation and diversity. Projects that meet the program eligibility requirements may involve, but are certainly not limited to, the development of labour and skills related infrastructure, such as staff accommodation, value-adding to enhance existing experiences through the inclusion of new technologies, or developing existing products to incorporate a higher level of interpretation for guests with the assistance of external experts, like historians. To all of our eligible ECO, ROC and Climate Action Certified businesses, we urge you to take advantage of this fantastic opportunity and apply for a TIRF Grant. Not only could it help you develop your business and build on your competitive advantage, it will also help to enhance the quality of Australia’s regional tourism experiences. Online applications for Round 2 of the TIRF Grants Program close on Wednesday 7 August 2013. For more information on the program or to apply online now, click here. Shark tourism has it hook, line and sinker! New studies conducted by the University of British Columbia have found that shark tourism is rapidly rising in popularity and is predicted to double in the next 20 years. In fact, shark tourism is expected to soon exceed shark fisheries in terms of profitability. Not only is this fantastic news for our aquatic friends, but also for shark tourism operators and tourists alike. Shark tourism has been popular for many years, whether it be offering travelers the opportunity to swim with whale sharks or experience a close encounter with a great white from the safety of a cage. Other than providing a sure adrenaline rush to the adventurous visitor, shark tourism has also played an important role in raising awareness of entire species’ under threat and has helped to push the importance of protection programs. Sharks have long been targeted by fisheries for their fins, which are often used to make dishes like shark fin soup. However, the introduction of protected areas and shark sanctuaries has impacted on fisheries and led to bans on shark fishing in various destinations around the world. These restrictions and protected areas now provide safe habitats for shark reproduction, allowing various species to regenerate. These recent findings predict a positive future for our Ecotourism Australia certified shark tourism operators. To find out more about our certified operators and find inspiration for your own shark tourism adventure, click here. To read more about the rapid growth of shark tourism, click here. From left: Andrew Powell MP, Minister for Environment & Heritage Protection, Alan Curtis Daintree Discovery Centre, Jann Stuckey MP, Minister for Tourism, Major Events, Small Business and the Commonwealth Games. The Daintree Discovery Centre has been recognized in winning the Small Business category at the Premier’s Sustainability Awards held in Brisbane last Friday the 14th June 2013. The award was presented to the Discovery Centre’s Alan Curtis by Minister for Tourism, Major Events, Small Business and the Commonwealth Games, Minister Jann Stuckey. ‘The Centre has demonstrated it is a high achiever and a leader in adopting sustainability practices that reduce its environmental impact and strengthen its commercial viability’ said Ms Stuckey. ‘It sets high standards and receives $2,500 to support sustainable initiatives and everyone involved in the Centre is to be commended for their efforts’. In accepting the award, an elated Alan Curtis thanked the team at the Discovery Centre and owners / directors Ron and Pam Birkett who are currently abroad. He also added ‘We are a carbon neutral business since establishing our Carbon Offset / Bio-sequestration project in 2007, and we sponsor Carbon Flux research by James Cook University. The Centre is also one of 10 environmental research Supersites that form the Australian Supersite Network collecting scientific data across various ecosystems’. The multi award winning Discovery Centre is a world-class interpretive facility nestled in the heart of the Daintree rainforest, just 10 kilometres north of the Daintree River and boasts a spectacular Aerial Walkway leading to a 23m high Canopy Tower. Certified since 1999 by Ecotourism Australia, this Green Travel Leader currently holds Advanced Ecotourism, ROC and Climate Action Business certifications. The tower provides viewing of the very top of the rainforest canopy, while the walkway allows unprecedented access to the mid level rainforest. For international visitors, Self-guided Audio Tours are available in 8 languages. For more information, please visit the Daintree Discovery Centre website. For more information about ECO, ROC and Climate Action certification programs, visit our website. Spirit Safaris offer private and personal, genuine small group luxury tours to remote wilderness areas allowing visitors to learn about Aboriginal art and culture. The tours are ideal for photographers and artists, family, groups and business incentive programs. They offer day and multi-day extended tours with comfortable camping or accommodated travel. For more information about Spirit Safaris or to book a tour please visit their website. For more information about Nature Tourism visit our website.